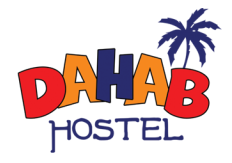 Dahab hostel has been open since 1998. This family run business, has been registered in all the major guidebooks and travel websites where it has consistently received positive reviews. Dahab Hostel has its own special charm. It is a collection of whitewashed huts on the rooftop attempting to recreate the feel of Sinai beach camp in an unremittingly urban Downtown Cairo. Once you get inside, you will sense the laid-back and cozy atmosphere. The outdoor garden area is just superb for lounging around and catching up with other travelers in the evening. The breeze is refreshing and the vibe is incontestable. You will be received by our team of professional, friendly and helpful staff, they are glad to help you with any inquiries 24/7. We want to make your stay in Egypt as smooth and hassle free as possible. It is an ideal place for all kinds of tourists. Enjoy laying back in the sun, smoking Shisha 'Water pipe' on the rooftop. Sit back and relax, plan your itineraries and catch up with your family and friends by logging onto our FREE WiFi broadband Internet service that covers the entire hostel. Our rooms are equipped with private facilities and A/C. We have Single, Double and Private Dorms available and there are 39 rooms in total. ● No Curfew or Lockout. ● Travel Desk/ Travel Info. ● FREE WiFi Internet Access. Dr. Abdel Alim Eltamamy & sons.